I have heard rave reviews about Burger Up located in Nashville’s 12th South since it opened in 2010, but there was always something that kept me from trying one of their burgers myself. I had heard their burgers were pricey, and as a college student my budget was tight. 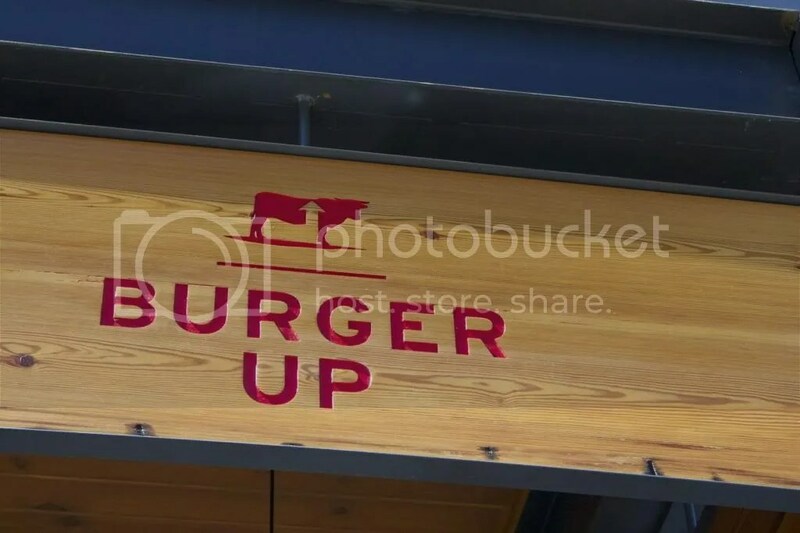 Then in 2012 Burger Up temporarily closed to deal with a family crisis. I decided it was time I give them a try back in December (especially since I was starting this blog! ), and I have since been back more recently. Both times I have gone, there has been a wait, which I expected from such a popular burger joint. I didn’t mind waiting, but the problem was there isn’t a good place to wait. There are a few small benches outside, but waiting inside isn’t really an option unless you want to feel like you are staring at people while they are trying to eat. In fact, although I like the modern and eclectic atmosphere, it just felt a little claustrophobic. The tables are really close together; it’s hard to even walk through the restaurant. Both times I’ve been I ordered the Black and Blue Burger, which consisted of a beef patty topped with crumbled blue cheese, blackening seasoning, red onion, and arugula. It was delicious! The arugula and crumbled blue cheese complimented each other really well. Burger Up only uses local farmers to supply their meat, so the quality of their beef is really good. Although the beef was high quality, the toppings were really fresh, and the meat itself was seasoned really well, I do have some complaints. If you’ve read any of my other posts, you know that meat:bun ratio is really important to me. There was way too much bun for this patty. In fact, the patty should have been bigger in my opinion. The first time I ate at Burger Up I left feeling slightly hungry. I don’t have a huge stomach to begin with, so that says something! I mentioned earlier that before going to Burger Up I had heard their burgers were pricey. They range from $9-$13, which really is pretty typical for a gourmet burger place. I am willing to pay that much for a good burger, but not when I leave hungry. As a side note (pun intended), I was disappointed in their sides. The first time I went I ordered the sweet potato fries. They were cut pretty thick, and weren’t consistently cooked. The second time I went to Burger Up I decided to try their fried vidalia onion tower (aka onion rings). There was too much breading on the onion rings, and I just wasn’t interested in eating them. My friend ordered the truffle fries, and she gave me a few to try. They were ok, but I wasn’t impressed. I really wish I could give Burger Up a better review. I would definitely recommend it to a friend, it just didn’t end my search for the best burger in Nashville.